Mayhem, the influential entity and musical force as we all know it refuses to die. Vocalists come, go, die, come back again… yet Mayhem forges on. Main songwriters perish or quit, yet Mayhem endures the hardships that come along with the passing of time and bizarre relationships that congeal at the core of a band. 30 years of soldiering on, with only 1 original member at the helm (Necrobutcher/bass), you’d think each serious change in personnel would bring with it a stylistic shift, or deviation from a set formula. Mayhem isn’t without it’s evolution. 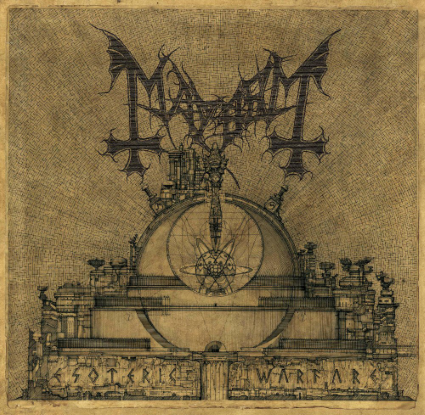 From the crusty death punk eruptions arising from the 80’s, to Euronymous’ embracing and perfecting of the black metal aesthetic, Mayhem struggled to find themselves during their formative years. When they did, a new generation of black metal was forged with Norwegian steel. With the introduction of Blasphemer on Wolf’s Lair Abyss, the past was indeed alive, but his musical innovation and vision maintained the core blackness that was Mayhem, while pushing the sound into coldvoid realms of synthetic modernity. Enter new guitarist Teloch (Nidingr among others), who has seemingly picked up in this story where Blasphemer left his bookmark, and continues onward with Esoteric Warfare with nearly the same cold and calculating sound that was experienced on the ever impressive/chaotic Ordo ad Chao, though it suffers in the shadow of such a chaotically grand statement. To be completely honest, if you told me that Blasphemer was still in Mayhem, upon hearing this album in its entirety, I would believe you, for Teloch has emulated his predecessors style quite effectively with clinical/dissonant guitar noises/attack on harmony and a precision playing style that cuts through regardless of speed or chugging slow/mids as found on the wandering track MILAB. This song in particular feels like a stylistic emulation of Grand Declaration of War mixed with Ordo ad Chao. It is interesting to the senses, but the song, along with other tracks on this album strike me as more “sound” driven than focused on creating actual content with impact or memorable song qualities. Teloch has the chops and the sound/style down, but Blasphemer’s legacy in Mayhem triumphs as it is apparent he was the better and more creative songwriter. Ordo ad Chao was a lethal art piece, even with its muddy production and layers of audial insanity, the songs held up on their own as potent, even vital entities with something to say. On Esoteric Warfare, the faster songs like Throne of Time and PsyWar feel much more in league with quality Mayhem material, leaving the slower tracks to wallow within the confines of a predetermined sound and production, really not taking flight or relying on the true weapons within this band; namely the percussive genius of Hellhammer and equally nuts vocal stylings of Attila Csihar. On the slower songs, it even sounds like Attila doesn’t know what to do with them, holding back on his delivery as if to let the song unfold and take root… something that sadly never fully happens. The aforementioned Throne of Time and Posthuman are great tracks, finding Attila doing what he does best by contorting his pipes through all the unique ranges in his vocal arsenal to portray a mind riddled with madness. That deeply sinister croak still does it for me. Interesting review Marty. I bought this record on a weird impulsive blind faith response. That was largely due to my new found love of ‘Ordo Ad Chao’. After I professed my strong disliking of all things Mayhem-post-death of Euranus here on the Worm, I questioned my long standing conviction and listened to everything after De Myst’. The only album that I thought was notable and actually quite outstanding was the aforementioned. Additionally, the two new songs seemed quite good, so there ya have it. If this ends up sounding like you say it does, then yeah, a little disappointing, however, from the new songs I heard a few months back (haven’t heard any others) I think it has something else to it. We shall see…. This entry was posted on May 28, 2014 at 6:02 pm and is filed under ALL REVIEWS, M-reviews.You can follow any responses to this entry through the RSS 2.0 feed.You can leave a response, or trackback from your own site.